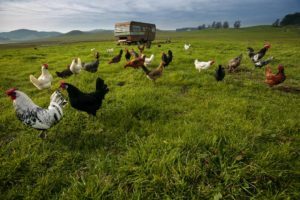 In the first half of the 20th century, the explosion of chicken farms amid the sunny, fog-kissed hills of Petaluma lined residents’ pockets with a feathery fortune and gilded its reputation as the richest little city in America. Dubbed “Chickaluma” and the “Egg Basket of the World,” Petaluma produced 612 million eggs in 1945, from an estimated 6 million hens. Chickens of Annika’s Eggs at Moreda Family Farms in Petaluma. The region had the rich, alluvial soil, cooling fog and sunny hillsides required for chickens to thrive. On Petaluma’s southern end, a series of sloughs allowed the eggs to enjoy smooth sailing on boats heading south to the Bay Area market, where they arrived unbroken and unspoiled. The area developed into a hotbed of innovation and entrepreneurship, particularly with the invention of the world’s first incubator. After World War II, however, the small family farms were slowly bought out, and the once-proud industry collapsed in the mid-1960s, a victim of farm subsidies, urbanization and a new generation intent on leaving the farm behind. Each April, Petaluma still cracks open a window to its egg-centric past during the Butter & Egg Days parade and celebration, where local kids dress up for cutest-chick contests and see how far they can throw cow pies. But most of the old chicken houses now recline like wooden skeletons, sagging back into the earth. Over the years, mechanization provided the impetus to increase the industry’s scale, allowing just a few Sonoma farmers, such as Petaluma’s Sunrise Farms partner Arnie Riebli and Petaluma Farms owners Steve and Judy Mahrt, to produce eggs in numbers that approach those seen in the Sonoma egg industry in its early good times. 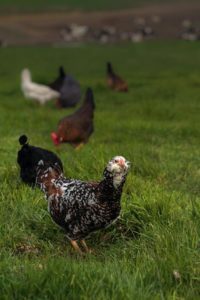 In the past 10 years, however, two forces have fueled a growing demand for pasture-raised eggs. The “eat local” movement that took root in the early 2000s, combined with a back-to-the-farm ethos, inspired a new, younger generation of farmers to get involved in food production. Second, the 2008 passage of Proposition 2, an animal welfare ballot measure that went into effect Jan. 1, 2015, aims to ensure the health of laying hens by mandating they be capable of “fully spreading both wings without touching the side of an enclosure.” Many egg eaters appreciate such care. Today, there is a growing demand for pasture-raised eggs sold for $5 to $10 a dozen at local farmers markets and grocery stores. The home-grown movement also spawned a rush to raise backyard chickens. 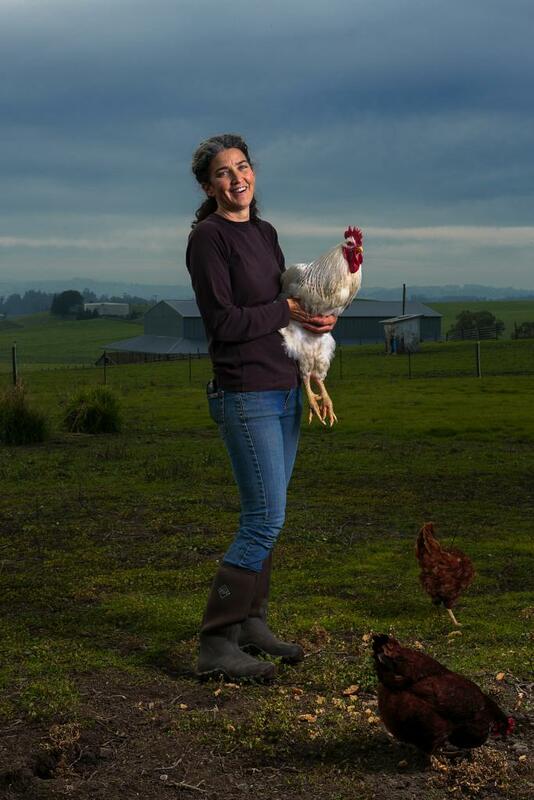 Dawn Dolcini of Tully Dolci Organic Farm holds a Leghorn rooster. 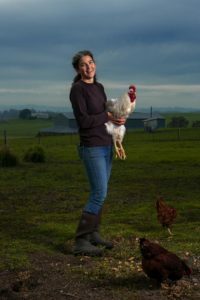 Meet the new generation of chicken ranchers raising heritage birds such as Delawares and Rhode Island Reds for both meat and eggs, often as a side business to a dairy or cattle ranch or as a second job. Like their grandparents and parents, these young farmers are finding there’s a niche for producing a food that provides a high-quality and affordable source of protein. Despite the hard work and high costs — gathering and cleaning the eggs, moving the henhouses, keeping predators at bay and buying grain for feed — the business of the small egg farmer has once again landed sunny-side up. Don Gilardi of RedHill Farms, a fourth-generation farmer in western Petaluma, went from raising lamb to producing chicken eggs seven years ago, after voters passed Proposition 2. 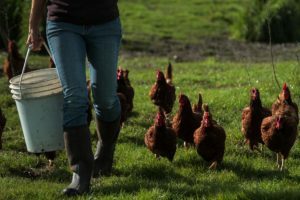 RedHill Farms now partners with 10 other pastured-egg producers to supply 10,000 eggs a day to 120 grocery stores in Sonoma and the greater Bay Area, including Whole Foods outlets. It helps that eggs are no longer shunned by the medical establishment. Despite years of worry about dietary cholesterol, a review of more than 25 studies published in 2000 by the Journal of the American College of Nutrition showed that eating an egg a day is not associated with increased risk of heart disease among healthy adults. In fact, nutritionists now tout pasture-raised eggs as a prime source of healthy, omega-3 fatty acids. And those watery egg-white omelets are becoming a thing of the past as consumers learn that the yolk actually holds most of the egg’s vitamins and minerals, including iron, vitamins A and D, phosphorus, calcium, thiamine and riboflavin. The deep color and rich flavor of the farm-fresh yolk is also what sends many Wine Country chefs swooning in the springtime as they prepare delicate dishes to showcase its charms. 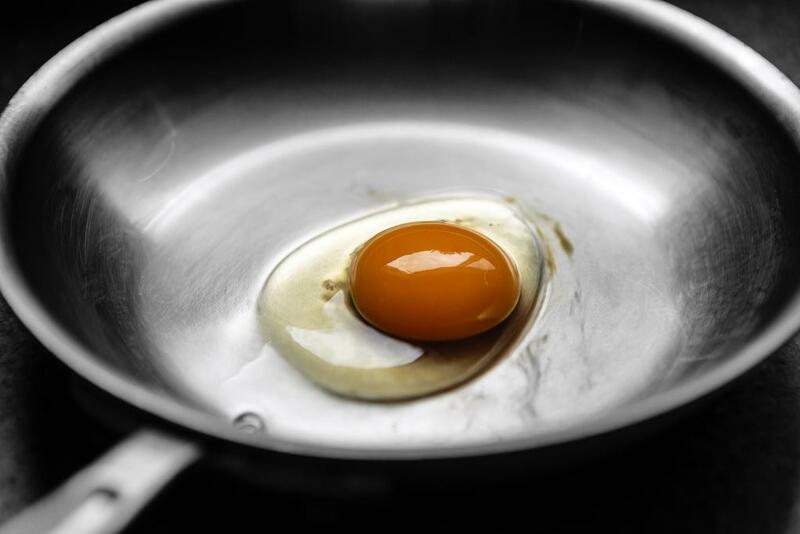 Fresh, organic egg from Annika’s Eggs in a frying pan. “The yolk color is nicer in the spring, because the grass is green. You just know the egg is coming from a good source,” Simmons added. Kay Baumhefner, original chef for the Della Fattoria Café who now runs the Come Home to Cooking school at her Petaluma home, once raised her own laying hens at a farm in Forestville. 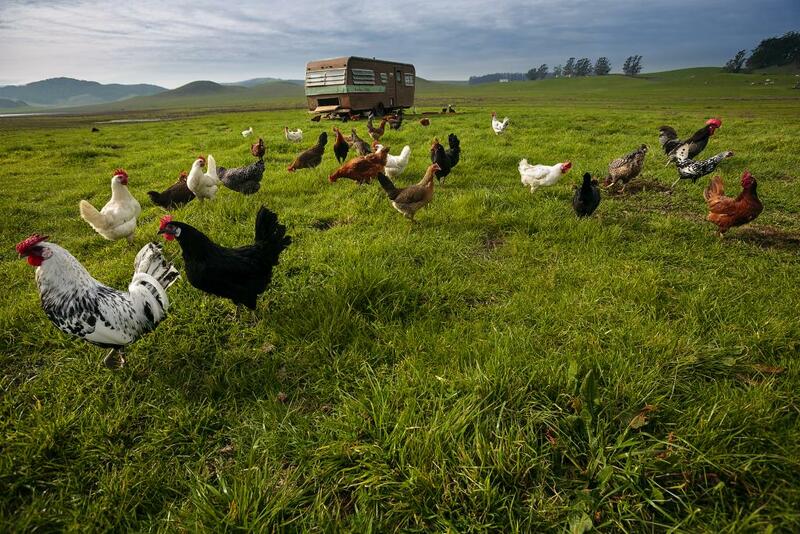 The new wave of egg producers comes from the chicken farms dotted among Petaluma’s rolling hills that Figone, Simmons and Baumhefner turn to when they want to make savory, spring egg dishes, from eggs Benedict to egg salad. Figone sources her eggs and chicken from Pepper Ranch Poultry in Petaluma, located at a former dairy farm on Pepper Road. The farm was founded by Craig Azevedo and his wife, Amy Swenson, who started raising chickens five years ago to make a little extra money. Dawn Dolcini of Tully Dolci Organic Farm. Azevedo is a third-generation rancher who rents land from his father, Pete Azevedo. He makes his living as a carpenter but still harbors the compassionate heart of a farmer. Over the years, the couple expanded their flock to 400 egg layers, including five heritage breeds. In addition to chicken parts and eggs, they also sell laying chickens to the growing ranks of urban farmers who want to raise their own backyard flocks. For the farmers market, Swenson makes homemade soup stock from chicken feet, and often feeds her family an “upside- down” dinner of scrambled eggs and hash browns. Figone eats an egg every day for breakfast, either poached or scrambled, with toast. The baker, who won the World Dessert Championship in 2014, also likes to bake the fresh, Pepper Ranch Poultry eggs into luscious treats such as lemon bars. The chickens of Annika’s Eggs at the Moreda Family Farms are housed in an RV that is moved around a big field in the middle of the valley. 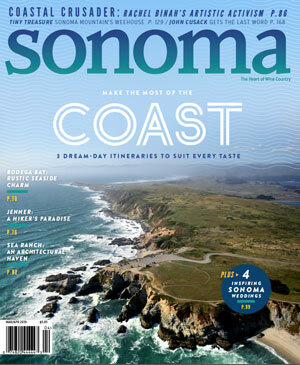 In 2011, Travis Moreda and Annika Urquhart launched Moreda Family Farms with 140 dairy cows pastured on 530 acres between Petaluma and Bodega Bay. 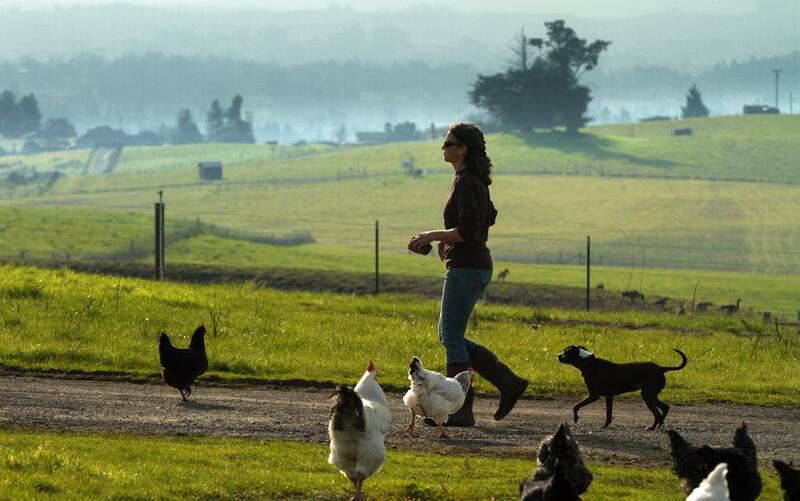 Urquhart started raising her first flock of chickens in 2013, as a way to diversify the small, organic dairy. She now looks after 140 chickens as well as taking care of the calves. The chickens lay their eggs in a former RV trailer that’s been outfitted with laying boxes and other chicken-friendly accoutrements. 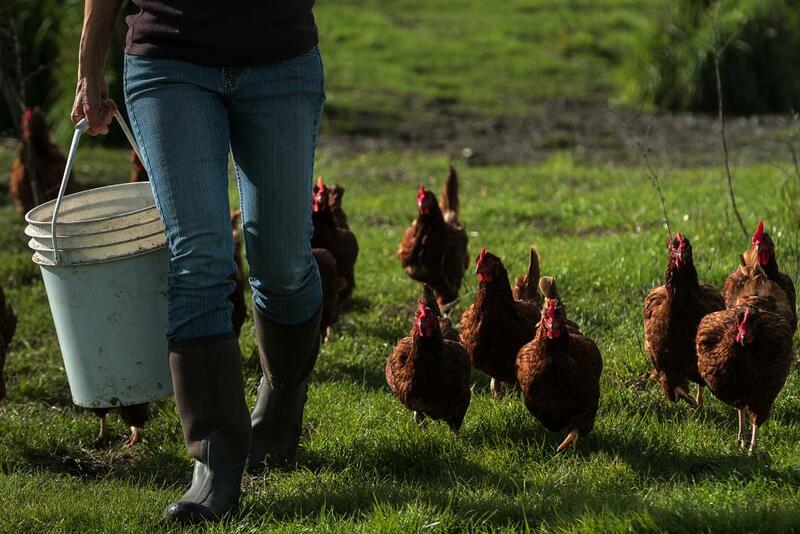 The eggs are mainly sold to Topsy’s Kitchen and Brickmaiden Breads in Point Reyes Station. At Topsy’s Kitchen, Simmons showcases Urquhart’s eggs in springtime dishes that often highlight Petaluma’s fresh dairy products along with seasonal ingredients like asparagus and morel mushrooms. Egg’s Benedict at Topsy’s Kitchen in Petaluma. 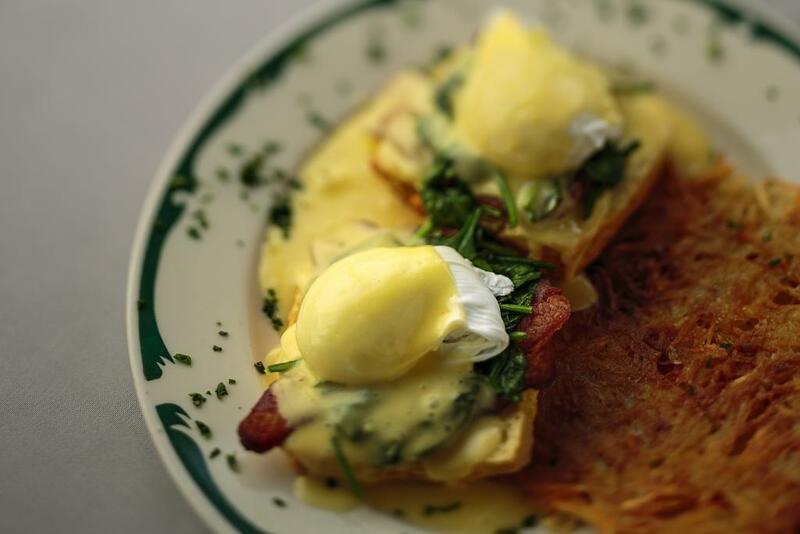 Along with eggs Benedict topped with lemony Hollandaise sauce, Topsy’s Kitchen also serves French-style eggs, baked in cream, butter, herbs and lemon zest. Another popular dish at the homey cafe is the croque madame, a base of salad and tartine (an open-faced sandwich) topped with ham, bechamel sauce, fontina and Comté cheese, then crowned with a fried egg. Baumhefner, who frequents the Marin Farmers Market in San Rafael on Thursdays and Sundays, buys her eggs from two members of the Dolcini family of egg producers: Kitty Dolcini of Red Hill Ranch on Point Reyes-Petaluma Road, and Kitty’s sister-in-law, Dawn Dolcini of the Tully Dolci Organic Farm, located on a former chicken farm on Hardin Lane. On a blustery day, Dawn Dolcini heads uphill to check on her “girls,” who share the ranch with grass-fed cows. She keeps about 350 heritage chickens, including Delawares, Barred Plymouth Rocks and Rhode Island Reds, in small, portable houses and in large, historic chicken houses left over from Petaluma’s heyday as the nation’s egg capital. During the day, the chickens get to scratch and peck throughout the farm, rooting for worms, earwigs and other nutritious treats. Chickens follow Dawn Dolcini as she carries a bucket of feed. Baumhefner likes to cook the Tully Dolci eggs for six to eight minutes, until they’re barely hard-cooked, and sprinkle them in a spring version of Le Grand Aioli, made with new potatoes, baby leeks and baby peas, then topped with homemade mayonnaise and green garlic. Instead of peeling and mashing fresh eggs to make deviled eggs, she cooks them, then cuts them in half, shell and all, with a sharp knife and scoops out each egg half with a spoon, serving a dot of green garlic aioli next to the yolk. If the egg is colorful, she may even keep it in its shell. In the spring, it’s important to choose a simple preparation that plays off the egg’s vibrant color and flavor. As an example, Baumhefner fondly recalled a fresh pea soup she ordered in Paris, which came with a poached egg floating in the middle. 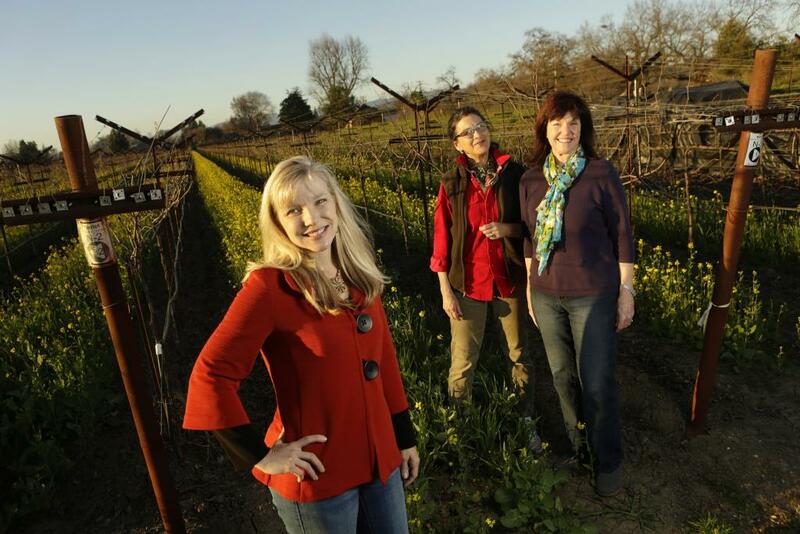 Women’s group fights back against anti-alcohol camp.